I follow Julie Stock’s blog and Twitter account, and bought the book on pre-order on the strength of her excellent blog posts. The book is a contemporary romance and some of your preconceived notions of the genre will be fulfilled and some won’t. In some respects this is classic check-list romance, but in others it is not, thank God. The first part of the story is written in first-person from the point of view of Rachel; the middle part is in the first-person point of view of Jackson; and the third part alternates between the two. 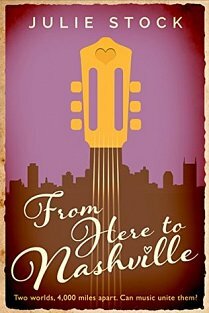 This works really well, particularly as Rachel’s point of view is in the setting of her home in Dorset, UK, and Jackson’s point of view is in the setting of his home in Nashville, Tennessee; where it alternates is when they are both living in the same place. I’m not sure the individuals’ thoughts were quite distinct enough, and it was slightly harder to “read” Jackson as a unique voice. The point of views remained true, though, with neither character getting in the way of the other's narrative – very well written. The classic romance elements are there – beautiful, talented woman; gorgeous, talented, rich man – and there is conflict in their lives (as there has to be in any story about relationships); there is an element of will-they-won’t-they, a best friend, an “other woman” and an “other man”. So far, so the same. What there isn’t – thank you, thank you, thank you, Julie – is a myriad of misunderstandings and crossed wires. The conflict comes from other areas, and they are entirely believable. I love that Rachel is torn between two lives, two men and two continents. Should she stay with the familiar-but-not-quite-enough, or should she take a risk and follow her dream, even though it may not work out? That sort of question is usually rhetorical in contemporary romances – we know what the heroine is going to do and we know that it is going to work out for her. In this book, we aren’t quite so sure, and that is a Good Thing. I love that the other man is a good guy and not a slimy git. I love that Rachel considers a career with the same importance as she considers a lover. I love that (almost) nothing is too over the top. This book gives what we want from a contemporary romance – escapism with a predictable plot – but it also gives a story that is interesting and which maybe isn’t quite as predictable as you might expect. The book is good and the writing is fairly solid, but I do have a few little nit-picks (because I am a bit of a cow and that is what I do). Plot and proofreading are good, but a copy-edit might have been useful. There are a few (not many) odd bits of punctuation – some misplaced commas and a few comma splices; a few “… and I” instead of “… and me”; and a few odd word orders. I think I would have suggested tightening the writing slightly – sometimes there is a little bit of wordiness that could have been cut. Why does “Open Mic” have initial caps and quote marks? And I would have put a red line through a fair few instances of "sweetheart" and "baby". I would have suggested rewording the few instances of a character explaining what their smile looked like – I would have preferred to have been given the background for imagining the type of smile for myself. I also would have suggested a little more description. For example, at one point Jackson falls asleep in front of “a movie” – it maybe would be a little more enlightening to give the name of the movie (so we get a teeny insight into his preferences), or say that later he couldn’t remember the name of it as it held no interest for him because he had his mind on lurve. That sort of thing – tiny instances that help flesh out a character. See? Nit-picks. This is a well-crafted and well-written novel. I think Julie Stock has a good story-telling career ahead of her. Cover: I love it – appropriate, professional and stands out. Internal design: I read this on a Kindle and had no problems. A little light to be a suitable choice. But there are some interesting relationships (romantic, family and friends) to dissect, conflicts that people can relate to, geographical settings to explore and music tangents to go down. What others are saying: Amazon UK readers give it 4.5 stars (2 reviewers – it7u was published only yesterday (16 February)); Goodreads readers give it 4 stars (1 rating). Over to You – Comment and Share! Thanks for commenting – I’m glad you are happy with the review. Your book deserves to sell well, and I so hope it does. Enjoy writing the second book! I enjoyed reading the review which is an excellent sign that I would enjoy the book. Interesting too that you chose to read the book so quickly as you enjoy Julie’s blog and twitter account – love seeing examples where showing the personality really works to encourage sales. Thanks Lorna. Julie is a superb example of how to connect with (potential) readers, as are you, as is Adam Dreece. Several other books I have reviewed or are waiting to be reviewed are as a result of my reading tweets and blogs and, just as importantly, comments to other people’s blogs. If I like what I read, I will always check out the book. If I am bombarded with an unacceptable amount of twittering ‘Buy my book’, I will unfollow and am unlikely even to read the blurb. I’ve found some great books via Twitter – it really does work as a marketing tool, but only once a relationship has been built, I think. And the relationships get built by good and relevant content that I enjoy reading (and as Lorna points out, includes the personality of the writer). If I find someone worth following and actively want to read their tweets, I will always check out their book(s).